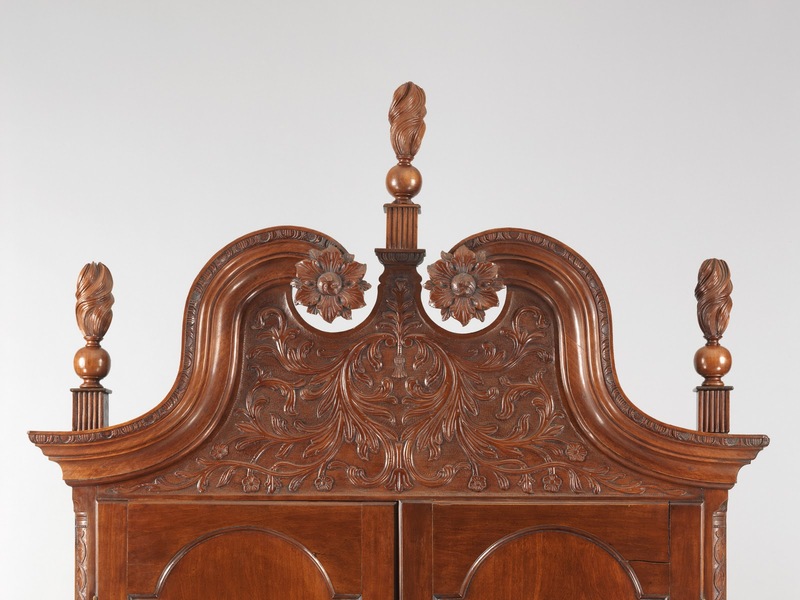 Ms. Cooper and Ms. Minardi’s newly released book appeals not only to woodworkers, but to anyone who is interested in early American history, culture, and furniture. They started their project over six years ago with the desire to bring to light little known facts about the culture and creativity of the 18th- and 19th-century inhabitants of southeastern Pennsylvania. Cooper and Minardi canvassed over 250 private and public collections, attended auctions and visited antique dealers in search of furniture with well documented histories. 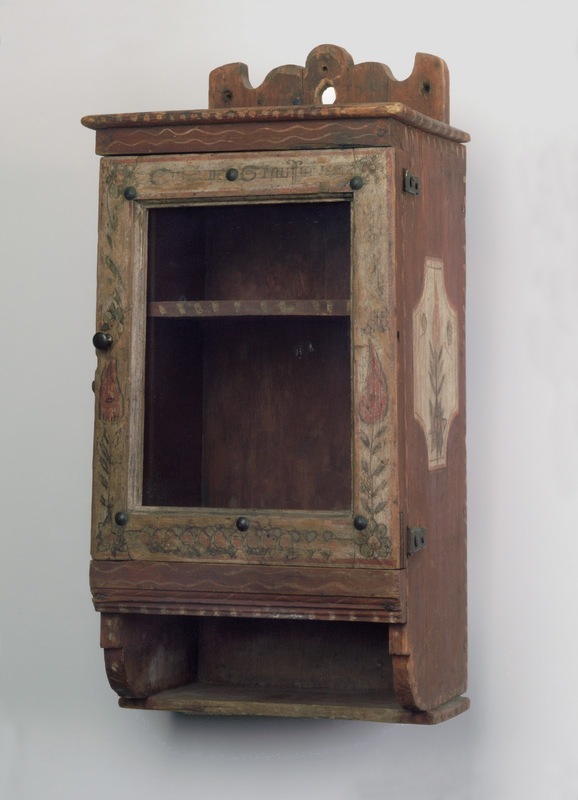 Their exhaustive research gives us fascinating insight into the everyday happenings of the inhabitants, and the furniture transports us into the lives of our ancestors. The first part of the book focuses on the people who immigrated to the area—equal numbers of English- and German- speaking people—and their attraction to a place that was tolerant of their religious beliefs and provided ample natural resources which would to lead to prosperity. The dense, tall forests, thick with black walnut, cherry, and maple were especially attractive to woodworkers. Details about the early settlers include occupations, inventories of possessions, costs of goods, countries of origin, and places of worship. Peppered throughout the text are excerpts from journals which give us a personal look at habits and personalities. The authors found that similarities in painted, inlaid, and carved decoration and construction were influenced by a variety of factors including region, ethnicity, religious affiliation, personal taste, socioeconomic status, and the skill of the craftsman. 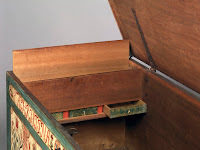 They also managed to debunk several myths—for example, notions about dower chests, most of which weren’t dower chests at all. In reality, the majority were made for young teens of both genders to store their possessions. 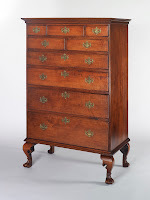 The quickly built chests accompanied them in their marriages and became part of their new homes. Another myth they dispelled is that the region was solely populated by Pennsylvania Germans. In fact, Pennsylvania was the most culturally diverse of the 13 colonies. 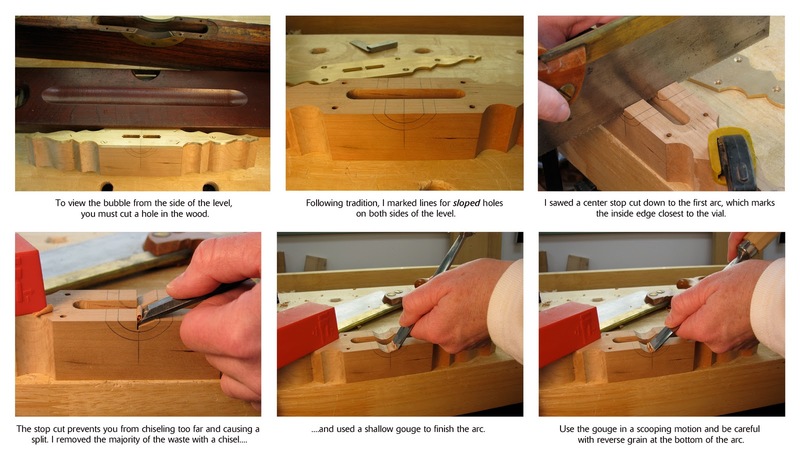 The authors provide detailed descriptions of the pieces that are showcased in the book including wood species, dimensions, design features, markings, hardware, and close-ups of carving and inlay. 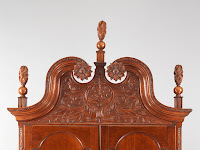 As furniture experts, Cooper and Minardi speak our language, pointing out of all the things we want to know about the furniture including unique features. 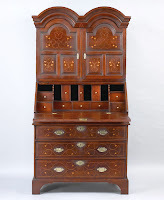 They uncovered an incredible number of fascinating things about the people, furniture, regions and craftsmen. 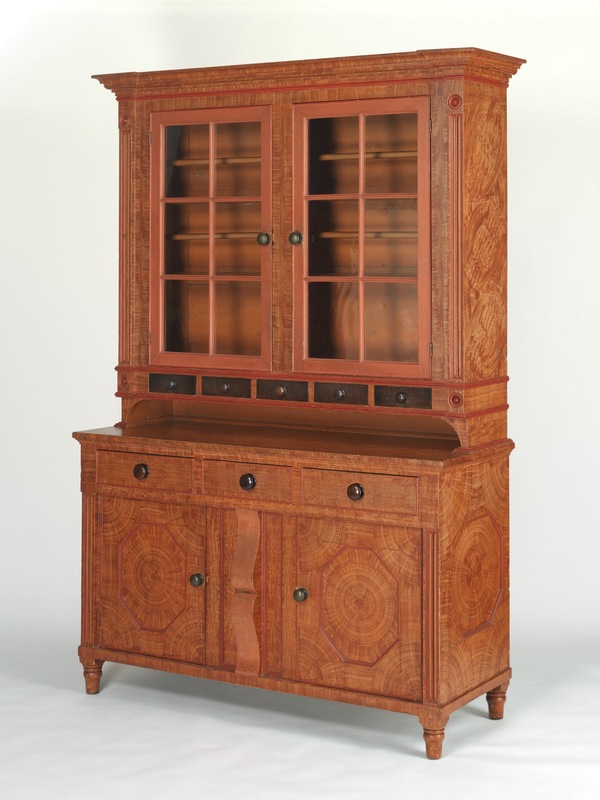 For example, in 1772 John Frederick Whitehead studied to be a cabinetmaker in Germany. After seven months as a young apprentice, he wrote, “I was no further advanced in learning the trade than when I began...the chief [thing] I did was breaking of Gimblets, bending of Chysels and Saws, spoiled boards and planes.” Later, he moved to Pennsylvania and became a weaver. Interspersed among the photos of more than 125 pieces of painted and high end furniture are numerous 18th- and 19th-century paintings of farmland and fertile, rolling hills of Pennsylvania; painted portraits of families and individuals who are highlighted in the text; photos of stone homesteads which are still standing; and archival images from the early 1900s. In addition, more than 30 pages of end notes provide even more information about the pieces and the people, and an extensive selected bibliography directs us toward further related reading. What an undertaking Cooper and Minardi embarked upon six years ago. To have compiled such a thorough and comprehensive amount of useful, captivating, educational, and inspiring information is nothing short of astounding. 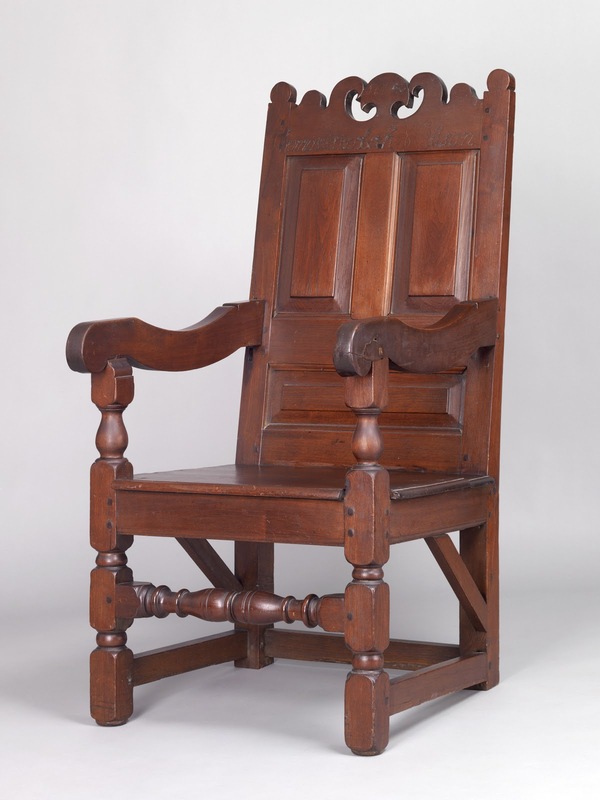 Their hope is that their work will lay a foundation which other scholars can use for more study about the people and furniture of early southeastern Pennsylvania. 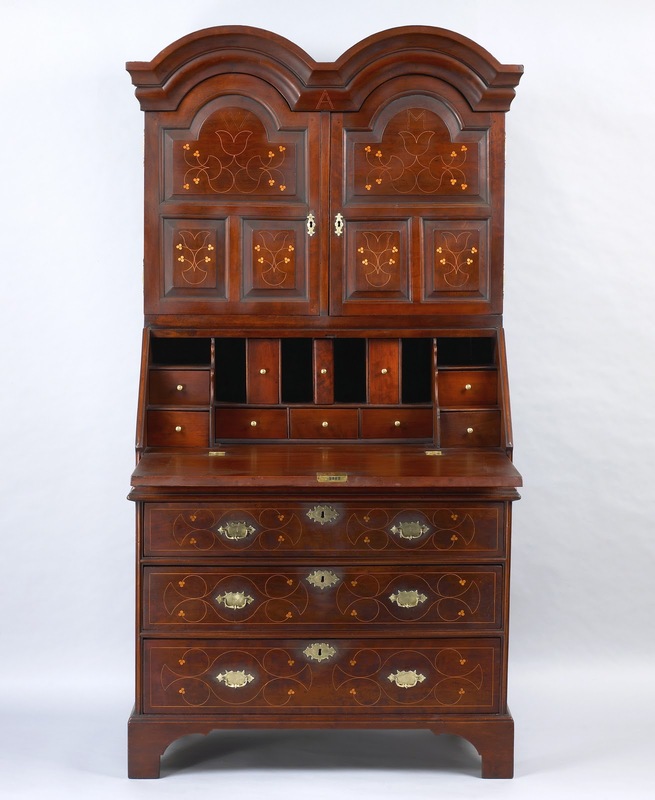 What they’ve also produced is a marvelous tribute to the craftsmen who made the pieces. The outside of the level still needs some final shaping and sanding. Despite this, I moved onto the next step because, well, I'm impatient. Levels require a way to view the vial not only from the top but from the sides. 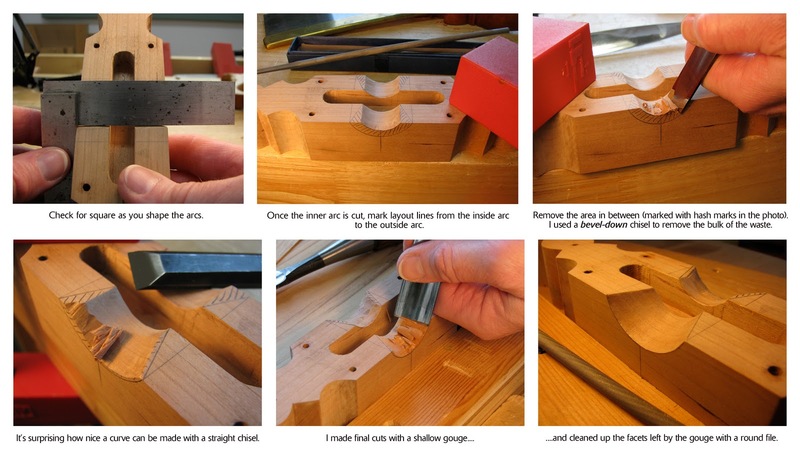 Wooden levels (at least the antique ones I own) have sloped side holes which necessitate a bit of shaping. Two arcs create the slopes—a small arc that is closest to the vial, and a larger arc that terminates on the outside surface of the level. 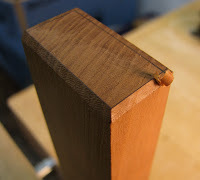 I used a chisel, shallow gouge, and round file to shape the sloped holes—quick and easy. I bet if I had planned ahead, I could have drilled the inner arc with a Forstner bit before cutting the blank for the level and the channel for the vial. But that's way too much forward-thinking for someone who's, well, impatient. Parts I and II for making this level are here and here. I promised my partner and brother that I'd make each of them a meditation bench for Christmas. My partner's was finished about two weeks after the holiday. My brother's was finished last weekend—10 weeks late. Ah well. Meditation involves patience, right? 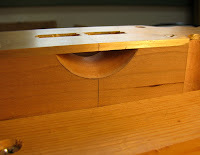 My brother did not want any carving on his bench, so I decided to add a little pizzaz by making the bevels on the tenons and mortises more pronounced. I freehanded the chamfers on my partner's bench, but decided to lay out the ones on my brother's because they would be more noticeable if they weren't dead-on perfect. This is easy to do. 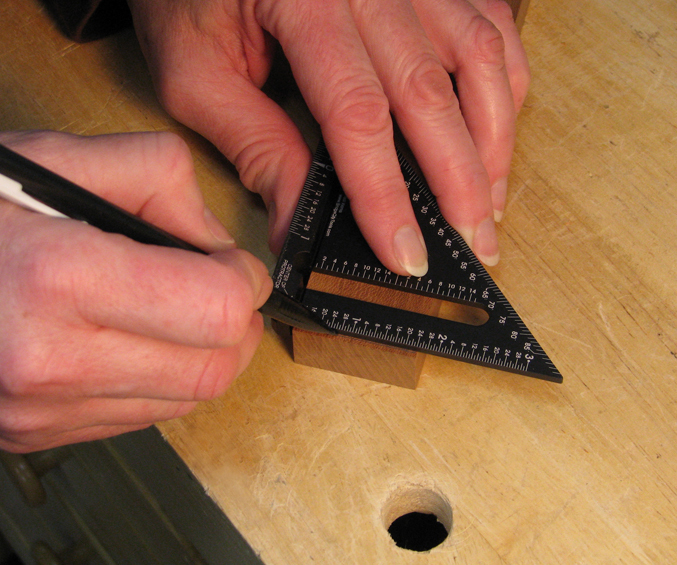 Just draw your layout lines* on all four sides of your workpiece to mark the bottom of the chamfers. Then draw four lines on the endgrain to mark the top of the chamfers. 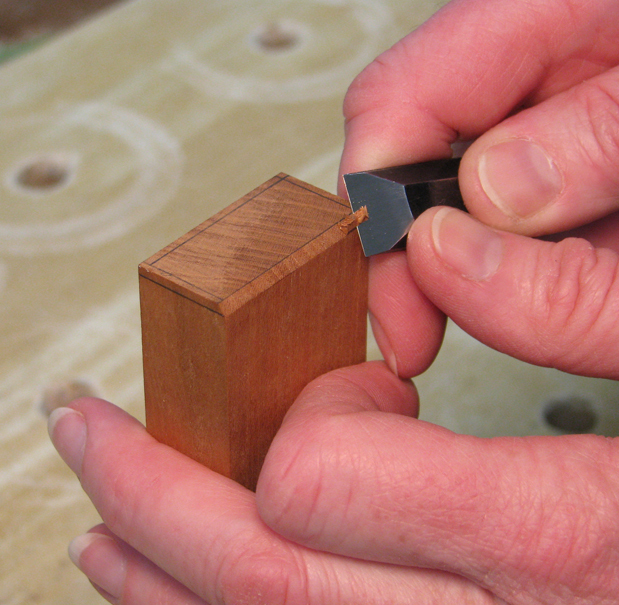 Remove the waste in between the lines by shaving in an upward/slicing motion with your chisel. Stop before you get to the end of one side, then pare from the other direction. This will prevent tearout at the end of the cut. 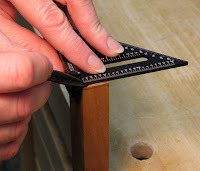 If you keep your blade inside the pencil lines as you pare away material, the bevel will be consistent on all four sides. There are now three meditation benches in our house (I haven't mailed my brother's yet—the finish is curing). 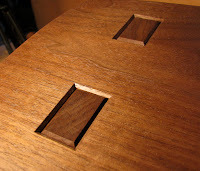 One is pine, one is cherry, and one is walnut. All three are almost identical and yet all three have a different feel when you sit on them. I suppose this has everything to do with the wood itself. Another curious thing is, the longer my partner has used hers, the more comfortable it's become to her. Again, I think this is due to wood's nature. 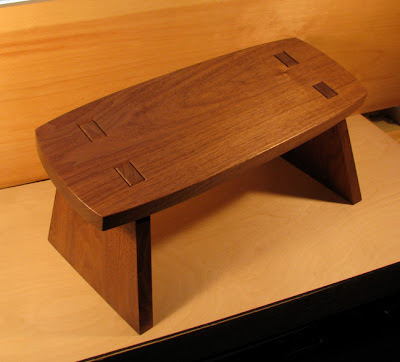 Our wooden planes mold to our bodies—why not benches? *A friend on facebook asked why I used a pencil to lay out the lines rather than a marking gauge. 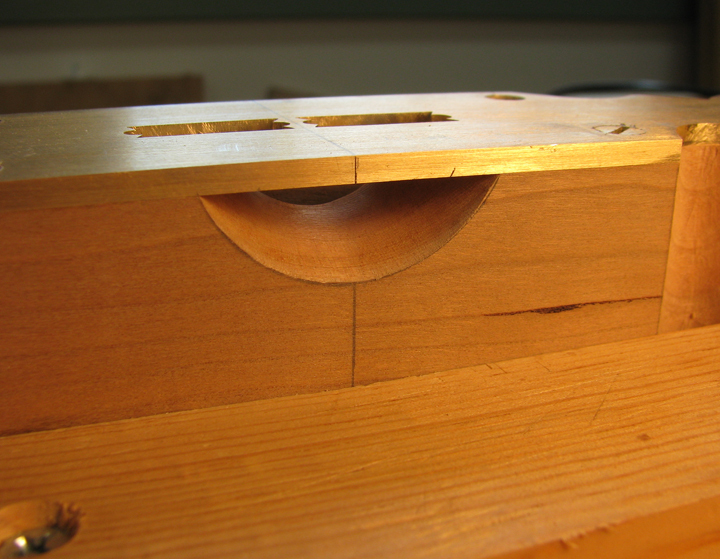 Here's why: The cutting gauge would have left score marks that would only have been removed if I had chiseled beyond the marks. 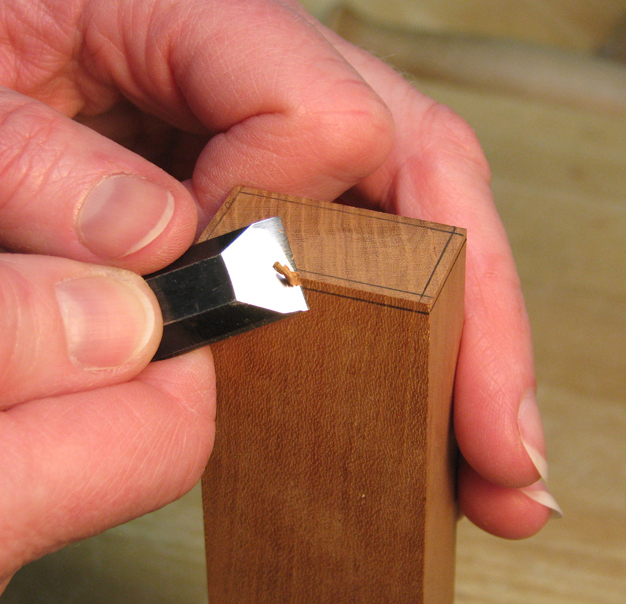 That would have made it more difficult to keep the bevels consistent.